By going through the green channel, you implicitly indicate to the tax administration that you have nothing to declare. Personal use goods or souvenirs, clothing, footwear and costume jewelery in reasonable quantities and in non-commercial quantities, provided that their value does not exceed 1600 UCF*. Imports of cigarettes, tobacco products and alcoholic beverages are not permitted for passengers under 18 years of age. If in doubt, go through the red channel. Making false declarations or inaccurate statements to the General Tax Administration constitutes a customs offense punishable by law. * 1600 UCF = 140,800 kwanzas. 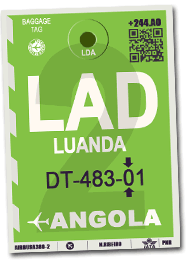 For tax residents in Angola, transport of any amount over US $ 10,000 (or equivalent in another currency).This cap is reduced to US $ 3,500 for travelers under 18. For non residents, transport of any amount over US $ 5,000 (or equivalent in another currency).This cap is reduced to US $ 500 for travelers under 18. In case of doubts about what to declare. Officers of the General Tax Administration or agents of the tax police in service are authorized to control the entry and exit of the currency at the Luanda International Airport. All travelers, tax residents or not, can't, at the time of their departure or their entry on the national territory, carry more than 50.000 kwanzas. (a) Tax residents of Angola, upon entry into Angola, may freely carry an amount in foreign currency up to US $ 10,000 or its equivalent in other foreign currencies. (b) Non residents, upon entry into Angola, may freely carry an amount in foreign currency up to US $ 5,000 or its equivalent in other foreign currencies. If the amount carried foreign currency exceeds the above limits, the traveler declare it to the General Tax Administration by completing the form " Declaration of entry and exit of funds". Tax residents in Angola over the age of 18 may freely exit the country with an amount in foreign currency up to US $ 10,000 or its equivalent in other foreign currencies. Tax residents in Angola under the age of 18 may freely exit the country with an amount in foreign currency up to US $ 3,500 or its equivalent in other foreign currencies. Non residents over the age of 18 may freely exit the country with an amount in foreign currency up to US $ 5,000 or its equivalent in other foreign currencies. Non residents under the age of 18 may freely exit the country with an amount in foreign currency up to US $ 1,500 or its equivalent in other foreign currencies. Any unreported foreign currency outflows exceeding the above limits will result in the seizure of money transported in contravention of Angolan law. The sums seized are transmitted to the National Bank of Angola. Upon his return, the traveler must regularize his situation with the banking institution.